You have had the items for 14 working days or less (not including weekends or bank holidays) after the day on which you receive the goods from One Stop Grow Shop. The items are in their original condition and unopened ready for resale by One Stop Grow Shop. 2) Check and test all the goods in your order and notify us within 5 days of any item that has been damaged in transit. We will usually require that these items are returned to us within 10 days of you receiving them so that we can scrutinise them and make any necessary claim with the courier. In particular, open, check and test all electrical/electronic items and any lamps that you have ordered and notify us within 5 days of receiving them if they are faulty or damaged in transit. This applies to ALL lamps including HPS (High Pressure Sodium), MH (Metal Halide), all types of Fluorescent lamps (CFLs and tubes) and any product containing these items (such as light kits and propagation/veg lights). If you find that any item(s) on your order do not operate as expected, DO NOT tamper with or otherwise try to repair it yourself as this will invalidate your warranty and will probably render you liable for repair costs. In the event that one or more of the items on your order does not operate as expected, simply contact us and we can discuss the matter to try to resolve matters or advise you to return the item(s) under warranty. 5) Below, you'll find a copy of our returns form. 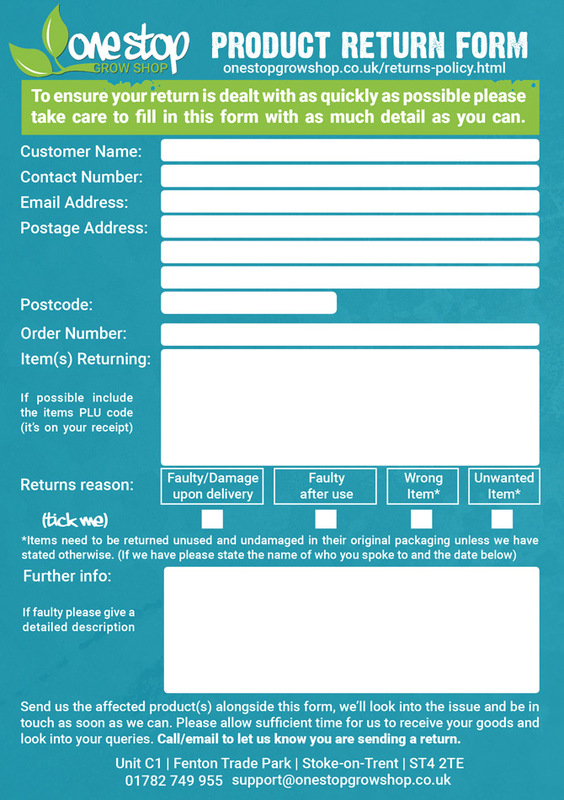 If you need to return any items, please fill one out with your details and place it inside the package, so that we can identify your order. A copy is sent out with each of our orders, but you can also print a version out by clicking on the link below.